I know I have gone back a day but I wanted to thank all the CBBC people who looked at my fuzzy photos of some ‘mystery ducks’ which I had seen the day before the field trip. Obviously, it was difficult to even see the birds on my camera screen so I emailed copies to a few people who I thought might be able to help. In the end the consensus seemed to be that the birds were Common Scoters, which is what Els had already advised me! To be fair Els had been confident of her identification and so I was pretty sure that is what they were. Having looked at some photos on Surfbirds I was more convinced and emails from Malcolm and from CBBC member Paul seemed to settle the matter. Just for interest, here is a fairly poor photo but maybe you can tell what they are! 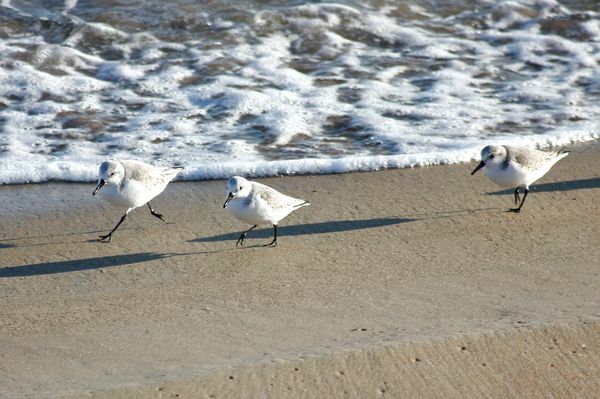 I have included a photo of some Sanderlings which we also saw running along the shoreline.